The sky promises rain. It smells like it, thick and heavy, enough that I go from disbelief to acceptance in a few quick thoughts. The first drops splatter on my cheek as I stare up to decide if I can make it to the trees before it really comes. I run and get in close, snug up to a trunk where it is still dry. That’s the last bit of forest rain will touch, right there along the trunk with layers of branches above. It can take hours for rain to reach it with a good tree. This one is good enough, I think, at least for next few minutes. I sling off my pack, pull out gear, and prepare in the little halo of dry ground. A bit of food to eat and a bit in a pocket to keep my energy up. Rain jacket and pants. Backpack cover. A poncho over it all. You’ve done this before, I tell myself, almost sighing it out loud. I know, I answer, I know, but still it wears on me. I think of straws and camel backs then kick the thoughts out of my head. I lift up my pack, throw over the poncho, and start walking. It is raining. It has rained before. It will rain again. I am still waterproof. I think of waiting it out in a bus shelter a few miles later. The roof is comforting and there is a bench to sit on. I hide inside and peek my head out the door to stare up. The rain seems like a slow leak, not nasty, no edge to it, the kind that isn’t out to kill you, just add a bit of steady drip drip drip of suffering to the day. I frown and step back outside. I need to walk. I need to move forward. Waiting around when you want to move is its own drip drip drip of suffering. 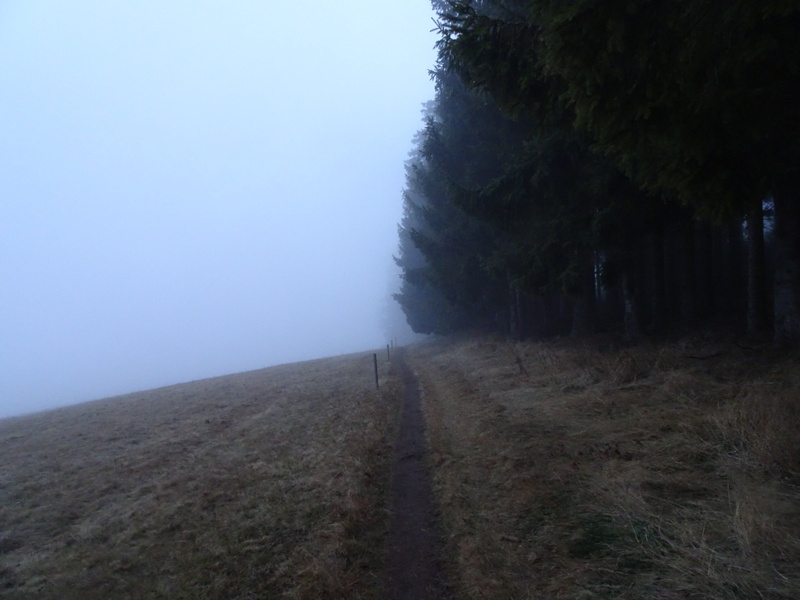 I pull my hood tight and keep walking, following the little red diamonds that mark the Westweg, this bit of trail I’m following through the Black Forest. The rain becomes more of a mist as the clouds drop low. They fall until they’re all around me, drifting though the black treetrunks, shrinking the world down to a few dozen steps. I’ve done this before too, I think, back in Norway, back where the stones faded in and out of the fog and finding next felt like a little victory. I was alone then. Far, far alone, like the last person on Earth alone. I hear cars in the distance, their engines rumbling away. I see their headlights in the mist when I cross big roads, but I hardly see another person. I’m alone here too, in a way, alone because the trails are empty of those who choose which days to spend outside. The rain stops, fading out and leaving only the fog, thick and heavy over everything. It makes reality messy. Time doesn’t really work right inside it. Minutes and hours slide by with no changes, creeping slow or fast without any indication which. I only walk, letting my mind wander away, my legs left to muscle memory, drifting along with time, letting the miles come as they will until some invisible hand slowly dims the light on the world. There is no sunset to chase. No mountains to stare at or towns to light the valleys. There is only a few feet and fog. I find a three-walled shelter to sleep in. The benches are too narrow, but the dirt floor is dry and there is comfort under a roof. Outside the fog drifts and time slides by. I sit and read and eat a bit of food as I stare out into the wall of mist. Then I close my eyes to sleep, wondering what I’ll see when I open them again. Posted in Europe North to SouthTagged backpacking, E1, ENS, Europe North to South, featured, Germany, hiking, thru-hiking, WestwegBookmark the permalink. Excellent description of fog-walking, Daniel. It takes away almost all references — time, space, progress. No sharp edges. No contrast. The world shrinks. ” Waiting around when you want to move is its own drip drip drip of suffering. “. Love this line. So true in so many settings. Your perseverance Daniel is such an inspiration. That you keep choosing the harder path on an already hard journey. God speed and keep the stories coming. We are all rooting for you. We would also understand it and be a bit relieved too if you occasionally chose an easier path! This is yet another wonderful metaphor among DO many that you offer up in your writing. “Until some invisible hand slowly dims the light on the world”. This and so much of this post just makes me shake my head in appreciation of your ability to give your senses to us through your exquisite writing of them.